Whether you are experiencing neck or back pain, spinal decompression therapy offered at Pray Chiropractic may be your perfect solution. We’ve often seen patients who scheduled themselves for back surgery or were planning on going on disability, unable to work. With the help of spinal decompression therapy, they were able to cancel their surgery and are back to their daily activities. You’ll lie on the comfortable table and feel a light, gentle pull on the spine. This dynamic pull allows fluids to be pumped back into your discs so that they can heal. Our well-trained staff monitors you constantly while you’re on the table. If your chiropractor determines that you may benefit from spinal decompression therapy, they’ll recommend it to you. Typically, about 20 total treatments are recommended, done three times per week, then two times per week, and then down to once a week. The success rate of spinal decompression is supported by pre- and post-treatment X-rays that show an improvement in the height of your discs. 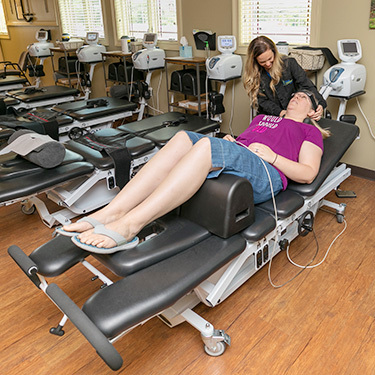 Our patients report not only a reduction in their pain but a feeling that their back has become more durable and stronger over the course of treatment. To maintain your results, we recommend that you have spinal decompression done periodically. It’ll help you remain properly aligned and flexible in your low back and neck. Contact us today to schedule your appointment and find out why we’ve been voted Best of the Best 8 years in a row by the Chattanooga Times Free Press.